While Cantrup was well–known in the Aspen community the next player was completely unknown. His name was Mohamed Hadid. To produce a detailed biography is a challenge since he always enjoyed a certain air of mystery. From what I have been able to piece together he was born in Nazareth, Palestine in 1948. His father taught English at the University of Jerusalem. When he was two months old his mother took him to stay with her mother in Damascus. When they returned they found the house empty and his father gone. The state of Israel had been created and they were refugees. According to Hadid his mother loaded him and her other possessions on a donkey and they walked back to Damascus. They assumed that Hadid's father had died. But after almost two years he turned up in Damascus and the family was reunited. He found work at the United States Information Service whose offices were transferred to Tunis where Hadid and his seven brothers and sisters spent the next ten years. But in 1964 Hadid's father got a job at the Voice of America in Washington and the family moved to northern Virginia where Hadid went to high school. His college education, if any, is rather murky. He did not get diplomas from the schools he claimed to have been enrolled in. He seems to have run a nightclub on the island of Rhodes and then he opened an imported car dealership named the Georgetown Classic Motor Corporation in Washington. This was followed in 1978 by the creation of a company called American Export and Development Company which exported construction equipment to Arab countries such as Saudi Arabia, Kuwait and Qatar. At the time many wealthy Arabs wanted to invest in real estate in the United States and Hadid and a partner opened a real estate firm, Oasis Development. Their first venture was an office building in Washington which was purchased with money from an investor in Qatar. This led to a variety of such transactions and in 1987 he became associated with the Saar Foundation. This was an entity founded by a Saudi that theoretically used the proceeds from its investments to fund various good works in the Middle East. In 1986 Hadid began doing real estate investing for the Foundation. In 1987 the Foundation decided that too many of its investments were in Washington and asked Hadid to look elsewhere. 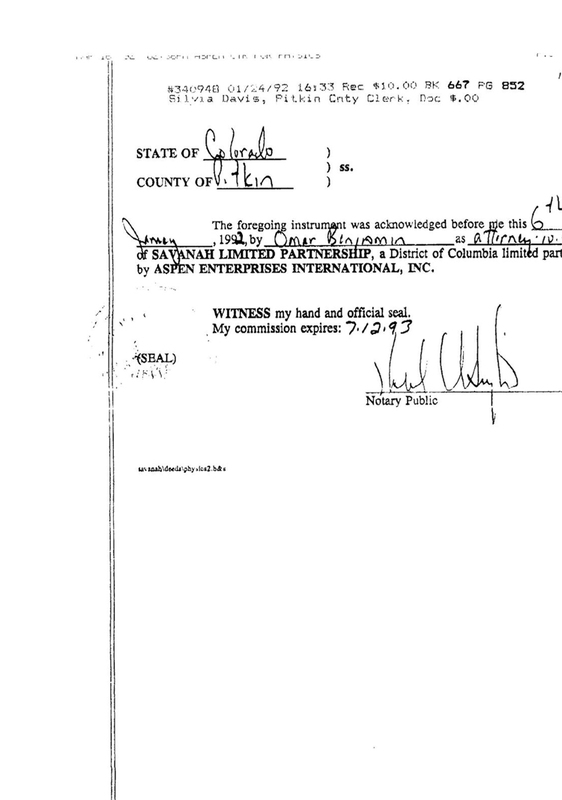 One of his associates was a lawyer named Alan Novak who had Aspen connections. It was he who clued Hadid in to the prospects at the base of Aspen Mountain. The sequence of steps that led from Cantrup to Hadid were about as complex as the quantum mechanical measurement paradox. They would not be worth our while here except that without these steps the Physics Center might never have acquired its land. This was potentially very serious. By the 1980's the Center had become one of the foremost research facilities in the world for doing summer physics. It had grants from places like the National Science Foundation and NASA. It had had visits by Nobel Prize winners such as Richard Feynman and Philip Anderson. There was a long waiting list each year of people who had not been accepted. In short it was a success beyond the founders' dreams. Yet it was on thin ice. Despite several attempts, there was no document from the Institute that the Center had any right to be there. Now, even if there had been such a document, it was not at all clear what it would have been worth. The situation was precarious. The Center desperately needed its land. The events that eventually led to acquiring the land began in March of 1983 when Cantrup and his wife declared bankruptcy and the 26 acres at the Meadows were returned to the Institute. This did not come as a big surprise. He had so many balls in the air at any given time that it seemed inevitable that he would drop a few. His debts were estimated at some $40 million. There was a Texas entrepreneur named John Roberts who was the head of something called the American Century Corporation in Dallas. He also had control of the Commerce Savings Association of San Antonio which lent him $42.9 million to buy the Cantrup assets. But nothing was simple and it took until January of 1985 before Roberts could actually buy the property. That May the City Council approved the plans for the hotel at the base of Aspen Mountain. But then Roberts went broke and a foreclosure proceeding was begun by Commerce Savings to regain its assets. 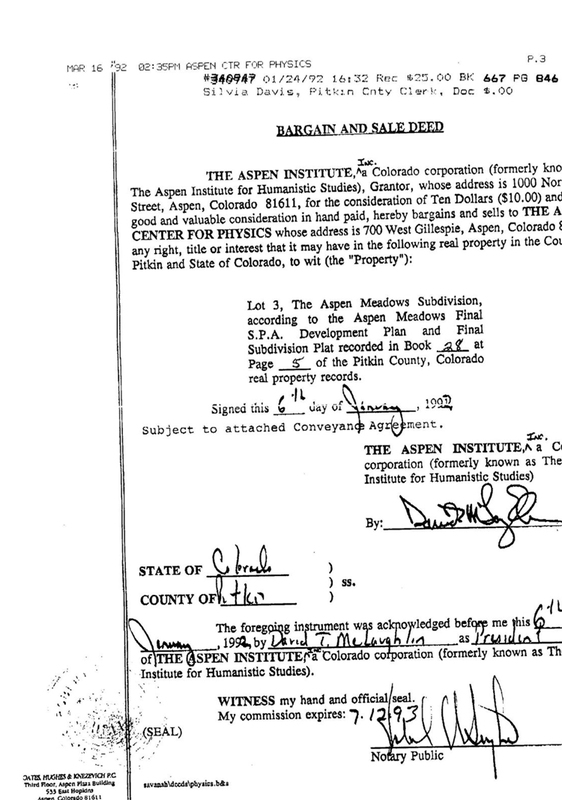 While this was still in process, in February of 1986, Donald Trump bought the land at the base of Aspen Mountain, or so he thought. Trump decided not to pay for his purchase until the Roberts–Commerce foreclosure proceedings were actually complete. This left a loophole. Roberts had a fixed amount of time to find another white knight, one who might take Cantrup's Institute assets off his hands. Trump had no interest in these. He wanted to build a hotel. He was so confident that no such white knight would be found that he actually hired a local architect to begin designing the hotel and in a gesture of good will offered to build the town an ice skating rink. The aforementioned Alan Novak, who had also been associated with Roberts, apprised Hadid of this opening. Hadid raised $42.9 million from his Mid–Eastern sources and bought the whole parcel of land from Commerce. Not only had he purchased what he thought was an excellent piece of land but he had the satisfaction of having beaten Trump out. This happened on the 26th of June. The following January the two men and their representatives met at the Waldorf Astoria in New York for lunch. Reports are that it was a “love fest” at which the two men talked of future mutual plans. Sometime after the lunch Trump sued Hadid. But this left in the air what Hadid planned to do with the Institute land which he now owned. 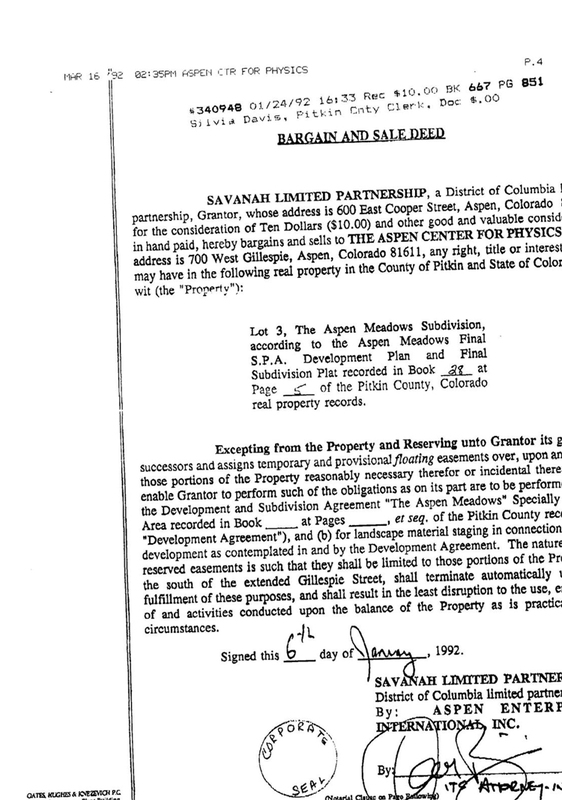 The company that Hadid set up for his Aspen transactions was called the Savanah Company and one of its associates was a man called John Sarpa. Sarpa had gotten his undergraduate degree from Indiana University and his law degree from the George Washington National Law Center. He was interested in the Middle East and had learned Arabic. While still in his twenties, he became Director of Middle East Affairs for the United States Chamber of Commerce. In this capacity he became part of President Carter's delegation, which negotiated the peace treaty between Menachim Begin and Anwar Sadat. One of his tasks with Hadid was to represent Hadid to the Aspen community. This was going to take some doing because it appeared as if Hadid wanted to use the open space by the Physics Center and land abutting the music tent for some kind of residential development. Sarpa tried to be reassuring by noting of Hadid that, “The environment is something he is very much in tune with and appreciates.” The image being presented was that when Hadid was not at one of his development sites he was tending his garden. Sometime after the purchase, representatives of the Institute, the Music Associates, the Design Conference, which held an international conference on the Institute's grounds in the late spring, and the Physics Center were invited to meet Sarpa. Since I was then a vice president of the Board of Trustees I was one of the representatives at the meeting. Sarpa walked into the meeting carrying a book. 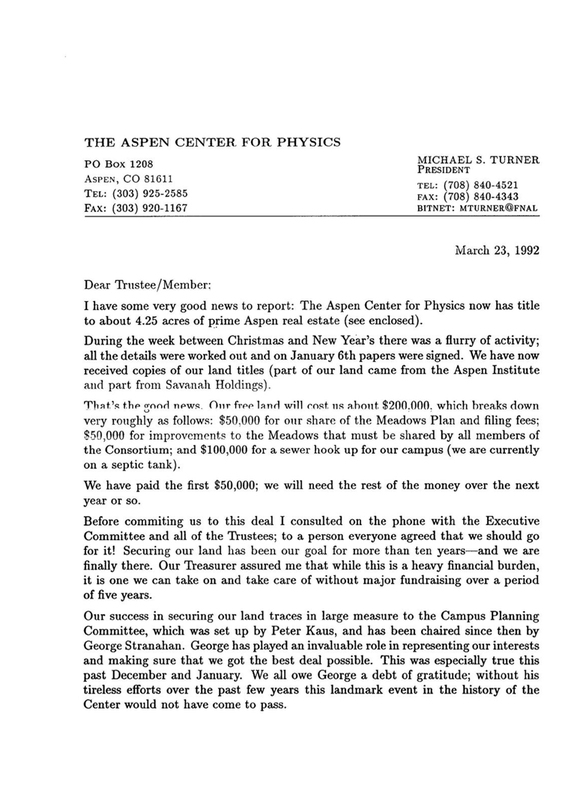 One had the impression that this was his first visit to Aspen – he now lives there – and the book, which he said he read on the plane, explained the “Aspen Idea.” As far as I knew the “Aspen Idea” was something that Walter Paepcke had in mind when he founded the Aspen Institute. Captains of industry would have the opportunity of learning about Greek philosophy in the morning from people like Mortimer Adler and in the afternoon go for hikes in the mountains. It was not clear what it had to do with the case at hand. Sarpa then produced a drawing of Hadid's vision for the land. The open space, which at that time was a prairie of native grasses and wild flowers, was to be replaced with what looked like a small village of houses. In the middle there was a taller structure which seemed to be a future hotel. I think that it is fair to say that the representatives of the non–profits, including myself, were appalled. It looked like the makings of a disaster. We all felt that the only thing that could save us from this folly was the Aspen City Council whose approval was necessary. Up to this point the Center had not been much involved with local politics partly because we were a summer institution whose participants went back to their universities once the summer was over. A few people like Stranahan were around during more than the summer but that was about it. It was clear that now we had to make our case to the community. At this point the physicist Elihu Abrahams came up with an idea of genius – the notion of the “circle of serenity.” This was an imaginary and somewhat irregular circle with its center at our buildings. It encompassed to the north the volleyball court on which the more athletic physicists and their families played spirited games. To the east was the Boettcher Seminar Building which was part of the Institute complex. To the west was the racetrack and to the south was our front lawn with a large bicycle rack that contained the bicycles that the Center loaned to the participants and their families. This whole circle was our “circle of serenity” and all we were asking was to preserve it for the Center's use. It was a very successful rubric, which even made its way into the local media. The image was of these physics professors unlocking the secrets of nature in this harmonious preserve. A practical effect was that the Center became part of a “consortium” of users of what became known as the “academic campus.” It excluded Hadid and consisted of the four non–profits, the Aspen Institute, the Music Associates, the Physics Center and the International Design Conference, which played a small role only at the beginning. It was understood that any arrangement for the land had to serve the needs of the consortium jointly. This was very important for the Center because if viewed objectively, we brought relatively little to the table as compared to the Institute or the Music Associates and now we had something like an equal vote. Peter Kaus, who had been president of the Center, had created a Planning Committee of which Stranahan was spokesperson and Kaus was chairman. One of the things that Kaus did was to fend off a suggestion that the Center move its operations to a less valuable piece of land somewhere else in Aspen. For the next few years various proposals were floated. It was suggested that the community should buy the academic campus and turn it over to the non–profits. This got nowhere. There was the suggestion that some of the land should be used to build a new elementary school. This also got nowhere. Elizabeth Paepcke, Walter Paepcke's widow, told the Aspen Times that, “The only person we can rely on with hope is Mister Hadid. Please trust Mister Hadid.” “Mister” Hadid was having his hands full with his hotel at the base of Aspen Mountain – a Ritz–Carlton. The Council approved its construction but then that approval was declared illegal. Finally it was decided to put the matter to a city–wide vote which Hadid won. 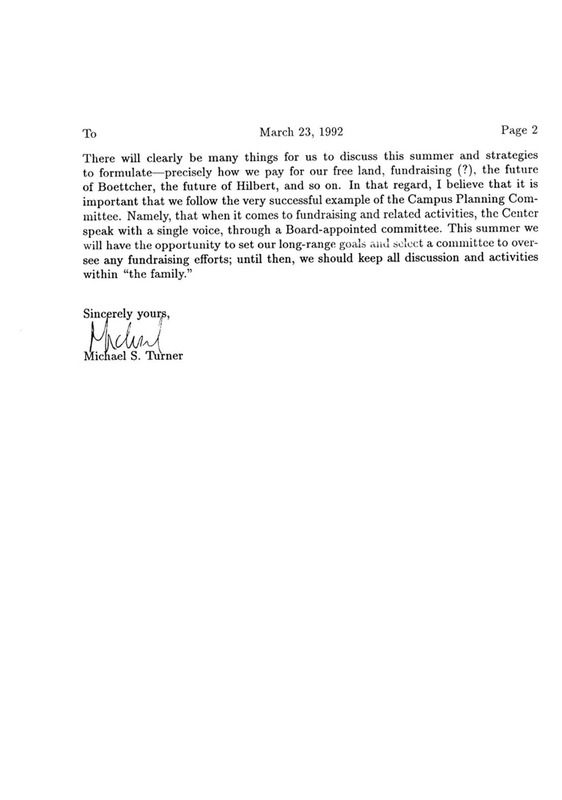 In November of 1989 Sarpa told the Council that, referring to the academic campus, which Hadid still owned, “We have no goals for the property outside those of the non–profits.” The idea of a little village on the academic campus had apparently been abandoned. Hadid simply wanted permission to build enough houses somewhere near the Institute so he could break even on his investment. During the unfolding of the year 1991 various things occurred that made it seem as if the whole project would collapse. The Gulf War was on and Hadid lost his Arab partner. He said that he was now borrowing money from “Martian” investors. He noted that, “I owe money to everybody on this planet, so it was natural for me to go off–world for my next investor.” He had tried to get permission to build houses on the west side of the Meadows property next to a river but had been turned down. Sarpa was back before the Council suggesting that building on the academic campus might be back on the table. Neighbors were objecting to what they saw as a potential increase in traffic on their residential streets. One of them, Anne Ibbotson, noted that “Just as George Stranahan and the Physics Institute want to preserve a 'circle of serenity', the West End neighborhood want to preserve a 'territory of tranquility. In June Hadid conceded the construction of the hotel to his Saudi partner. He was more or less down to his houses. The Council finally decided that Hadid could build four new houses. But where should they go? 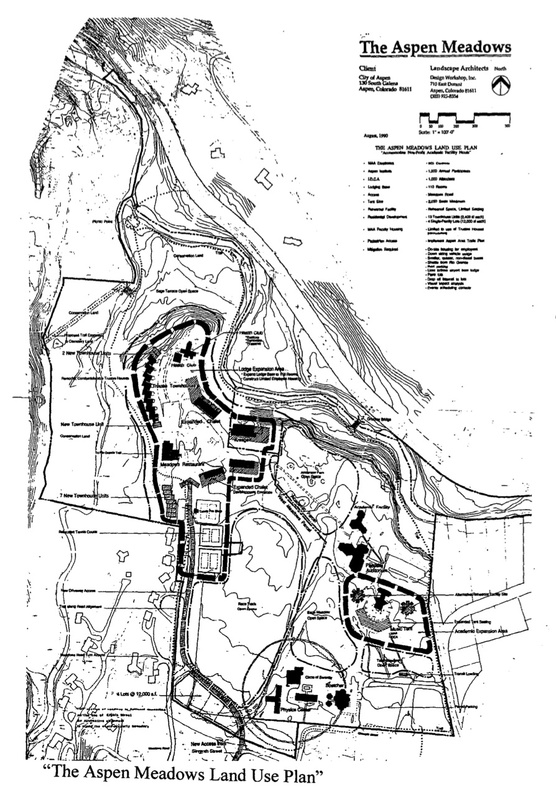 The original proposals located some of the planned houses on the Physics Center's circle of serenity to which the Center objected strongly. There was also a matter of a new road to which the neighbors objected vehemently. In short there was a total impasse. There then appeared a white knight. The name of this particular knight was “Charlie” – Charles B. Marqusee.